The SOCIEDAD AGRARIA DE TRANSFORMACION AGRICOLA PERICHAN was incorporated in 1997 as center for handling and marketing of the production contributed by its partners. It is also the distribution point of the group in both national and international markets, and as FRUTAS PERICHAN in MercaMadrid. Being suppliers for more than 20 years of the most prestigious supermarket chains has currently positioned us as one of the leading companies in Spain, with a volume greater than 100,000 tons per year. From its founding in MercaMadrid, it has always attempted to place in the different markets the products of the region which began being exclusively tomatoes, to go on to be a wide range of products (cucumber, green beans, table grapes, pears, iceberg lettuce, peppers, zucchini, etc.) to fulfill the different needs of our clients. It currently distributes and places all its products in Madrid, Castilla-La Mancha (Toledo, Ciudad Real), Extremadura, Castilla-León, the Cantabrian coast, the Basque Country and Galicia, also reaching Portugal. 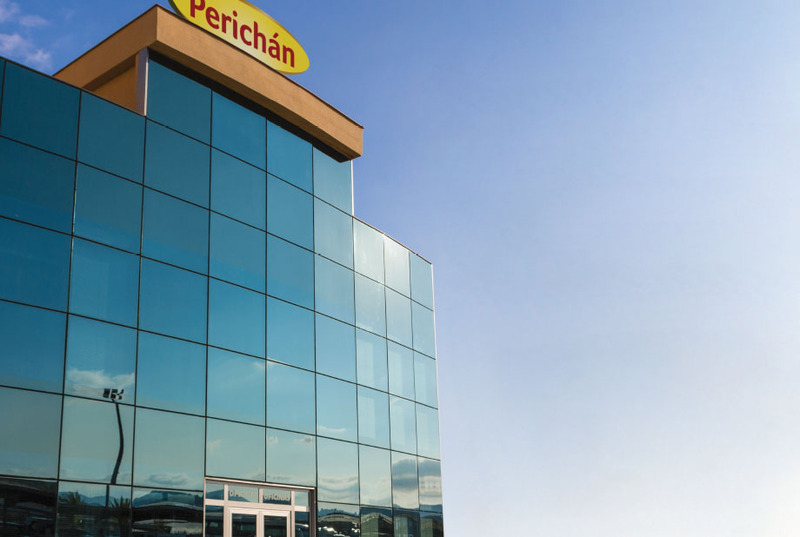 A producer company that was incorporated in 1993 which we know today as the PERICHAN Group. Currently, it produces in different areas of the region of Murcia (Cañada de Gallego, Mazarrón, Lorca and Aguilas). It has a cultivatable surface of 515 hectares, of which 100 hectares are of mesh greenhouses, 360 of plastic and 55 of orchards. With the goal of creating suitable conditions for each type of crop, a significant effort was made both in the improvement of the current production installations, and in the development of new facilities, with a clear investment in the latest production technologies: multi-tunnel greenhouses, with automatic control of opening, heating and the automatic application of plant protection systems, to attain greater control and better work conditions. It arose as a producing company in the province of Albacete as part of the expansion performed by the group. It has more than 100 hectares of protected crops, which includes heating by natural gas to ensure the production and more than 50 in the open air in the area of Cancarix, in a privileged environment due to its climate conditions and vegetation in which different crops are cultivated throughout the year. There is another farm in Isso with 40 has. of greenhouses in which are primarily cultivated green beans due to its wonderful conditions of humidity for this crop, thanks to the river Mundo that passes through the farm. This company originated in Morocco (Agadir) in 2005, and it has a surface area of 200 Ha. of greenhouses dedicated to the cultivation of green beans, both flat and round varieties. It was incorporated with PERICHAN with the commitment of delivering 100% of its production. It has 8 farms of various dimensions and located in strategic areas with excellent conditions for the cultivation of green beans.